Near the heart of Australia, from the parched dry plains of the Northern Territory, rises the biggest monolith in the world, the colossal Uluru (previously known as Ayers Rock). 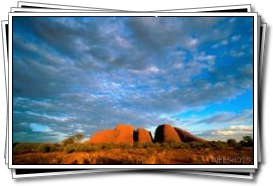 Called Ayers Rock by settlers, the ownership of the rock was transferred to the Aboriginals of the area and it regained its Aboriginal name of Uluru, which means Great Pebble. Uluru is one of earth's great natural wonders and encountering it for the first time is quite an experience. Consisting of mineral rich sandstone, Uluru measures 2.4km (1.5 miles) long and 1.6km (1 mile) wide and rises up to 867 metres above sea level. 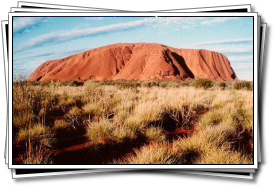 Uluru is a sacred site for the Aboriginal tribes, and has great spiritual meaning. Each feature of the rock has a meaning in 'Tjukurpa' or Dreamtime, the traditional Anangu law that explains how the world was created. 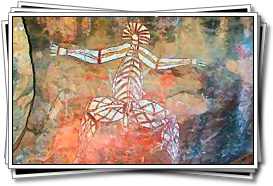 The caves in the rock have been decorated with Aboriginal paintings and prehistoric art, some of which indicate such things as the whereabouts of water and other vital information, others were painted for religious purposes and as a means of both storytelling and for a culture with no written language to teach and record its history. Apart from the sheer imposing size of Uluru, what can make viewing it so memorable is the fact that as each day passes the rock changes colour depending on the light and atmospheric conditions, and never remains the exact same permanent hue. Sunrise and sunset are perhaps the most magical, and it is easy to see why the native inhabitants held this area in such high regard. It is hard to come away from Uluru without feeling enriched by its calm spiritually and sense of permanence.